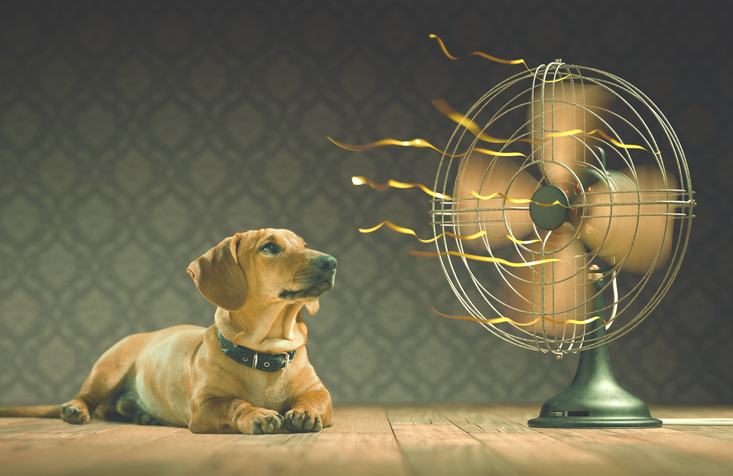 A dog sitting in front of a fan on a hot day. We use fans to keep cool in the summer. In the olden days ladies often carried fans. The goldfish's fins fanned the water in his bowl. Rick fanned his face with a newspaper. The dealer fanned the cards. Julie fanned the flames to get the fire going. The union leader fanned the workers' discontent until they went out on strike. My nephew is a huge fan of Harry Potter. hit the fan: to suddenly become very difficult. Example: “It all really hit the fan for the politician when the press found out about her affair.” There is also a common vulgar expression, “When the sh*t hits the fan,” which means the same thing. Fan dates back to before the year 900. The Old English and Middle English noun fann, meaning ‘winnowing basket’ (that is a basket in which grain is separated from leaves and twigs when tossed into the air) and comes from the Latin vannus, with the same meaning. It is probably related to the Latin ventus (wind), and comes from the Proto-Indo-European root wet-, meaning ‘to blow.’ The meaning ‘a device for moving air’ was first used in the late 14th century. The verb comes from the noun, and, with the meaning ‘to winnow grain,’ first appeared before the year 1000. Meaning ‘to move air,’ it was first used in the early 15th century. The other meaning (a short form of fanatic), first appeared in reference to baseball lovers in the late 19th century. Fan was suggested by Helen, from Chicago.